Bethany Shorb's microfiber tie features lines from Lincoln's Emancipation Proclamation. January 1, 1863: Abraham Lincoln issues the Emancipation Proclamation. 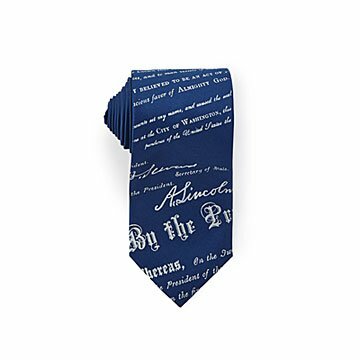 Commemorate that historic day with this tie featuring lines from Lincoln's monumental document declaring "that all persons held as slaves" should be "forever free." Made of microfiber and printed with water-based ink, it's a wearable reminder that some things are worth fighting for. It's also a thoughtful gift for a Civil War buff or proud history geek. Made in Michigan. When Boston-born artist Bethany Shorb isn’t creating sculptures, touring as a musician, or taking photographs, she’s likely designing incredibly cool ties and scarves. After receiving her MFA at Detroit's Cranbook Academy of Art, Bethany stayed in town to launch her design studio, creating fashion pieces inspired by art, science, history, and music. Her goal is to give people wearable works of art that are stylish, while reflecting the owner’s personality. She’s served as a cultural collaborator at Gallery Project, Ann Arbor, Michigan’s leading non-profit venue for challenging contemporary art, and on The Museum Of Contemporary Art Detroit’s “New Wave” board. She’s also a founding member of Detroit’s first hacker/makerspace, OmniCorpDetroit. Hand wash in cool water and take care not to rub the design too hard. Can dry clean (alert your dry cleaner to take care of the design). Iron on medium heat with a dry iron, no steam (keep the iron moving so as not to scorch the fabric). I would buy this gift again. Clever gift for my boyfriend who is an attorney.